Anticorrosive Rubber Lining discusses the state-of-the-art in this evolving industry, including sections on the best materials and formulations to use, what's best for a particular application, which repair technique is best for a given application, how long a rubber lining is likely to last, vulcanization parameters, and more. This book deals with the important field of anticorrosive rubber lining and its applications in various industries, including oil and gas, nuclear, aerospace, maritime, and many more, highlighting many of the technological aspects involved. 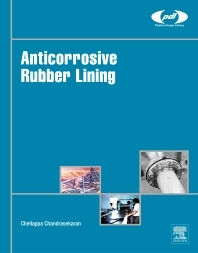 The author offers a unique perspective due to the exclusiveness of the case histories presented, including many industrial rubber lining practices which are mostly kept within the industry. The technical information on rubber presented here is a practical tool to enable engineers to make the best use of rubber linings to prevent corrosion in chemical plants. The book includes valuable insights into bonding systems, surface preparation, and coating methodologies, and also covers failure analysis of failed systems. Dr. Chellappa Chandrasekaran has over 40 years of experience in the Rubber Industry as a Rubber Technologist, has been exposed to several user industries and has written several books on various topics in Rubber Technology.